The Lynx 5000 is the less-renowned sister to the Yashica Lynx 14, lacking that model's massive f/1.4 lens. For those willing to sacrifice half a stop of lens speed to get a smaller package, Yashica offered a Yashinon 4.5 cm f/1.8 lens instead. One reflection of the size difference is the Lynx 5000's 46mm filter thread, as compared to the 58mm diameter on the '14' versions. The smaller lens diameter also makes possible a faster top shutter speed: 1/1000 sec. on this model versus 1/500 with the f/1.4 lens. The Lynx 5000 and Lynx 14 replaced the original Lynx 1000, updating its selenium meter with a new CdS-cell circuit. 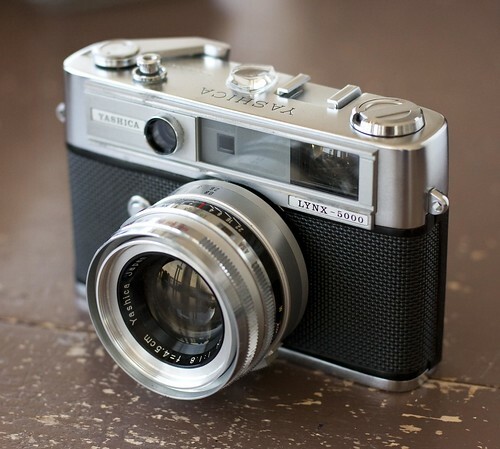 The 5000 was followed by the very similar Yashica Lynx 5000E, adding a revised "IC" meter, which offered viewfinder display lamps rather than an analog needle on the 5000's top deck. This page was last edited on 22 March 2019, at 00:20.